The handsome four-square profile of the Mele & Co. Brigitte jewelry box gives it a universal appeal that's both stately and demure. 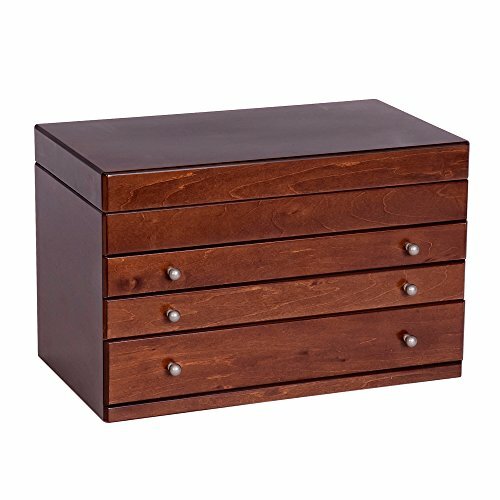 With a lovely walnut finish and clean modern design, this jewelry chest is sure to delight. Nevertheless, it's the sheer storage Capacity of this jewelry case that makes it truly majestic. Large jewelry chest in antique walnut finish. Lift lid with full interior mirror. Ten hook necklace drop. Top compartment features five divided sections, plus ring rolls. Three drawers. Top drawer has twenty one sections. Second drawer has ten sections. Deeper third drawer offers ample open storage. Hand lined in Chocolate sueded fabric. Brushed nickel tone drawer pulls. Features Mele & Co. Logo plate inside. 13 3/4" x 7 3/4" x 8 7/8". made in China. If you have any questions about this product by Mele & Co., contact us by completing and submitting the form below. If you are looking for a specif part number, please include it with your message.